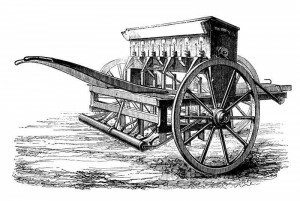 English agrarian Jethro Tull invents the first seed drill. The farming implement cuts small channels into the soil where the seeds are dropped. Unlike the “broadcasting method” of simply scattering seeds, the seed drill allows for fewer seeds to be lost to birds and other animals, and makes it easier to weed crops.